With pollen and smoke in the air, many people are having trouble with allergies right now. 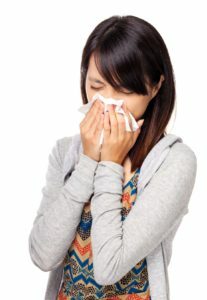 Allergy symptoms include: sneezing, asthma, runny nose, post nasal drip, stuffy nose, red eyes, itchy and watery eyes, scratchy throat, and possibly headaches. Allergies happen when your immune system is over-reacting to irritants in the environment. 80% of your immune system is in your digestive system. Often poor diet or problems with digestion can contribute to allergy symptoms. If there is inflammation in the gut, your immune system will be on hyper alert status. Take all sugar, alcohol, fried foods, spicy foods, and dairy out of your diet. These foods are very good at triggering allergic response in the body and producing phlegm. This is not something you want if you are trying to reduce allergy symptoms. Get plenty of sleep. You body restores and rebuilds itself during sleep, including your immune system. Try to reduce stress. Stress is a major contributor to allergies. Some suggestions to help include: yoga, meditation, tai chi, and qi gong exercises. Do moderate exercise every day. Strive for a heart rate 50% higher than your resting heart rate, sustained for 30 to 60 minutes. So if your resting heart rate is 80 beats per minute your target heart rate would be 120 beats. Drink plenty of water. You should be drinking 1/2 to 1 once of water per pound of body weight. The water should be room temperature or warm and not ice cold. If you drink cold water all the time your body has to put the energy it has for digestion into warming up the water. If you are having trouble with digestion and allergies this is a bad idea. Take vitamin C. It is a good antioxidant that will help with allergy symptoms (Ester C is a form of vitamin C that is pH balanced and better absorbed in your body) take 4000 to 6000 mg/day. Eat foods like: scallions, onions, local honey, pineapple, kiwi, and green tea (which is not only good for allergies, but also for your metabolism). Take a probiotic every day. Choose one that has several different strains of Bifidobacterium and Lactobacillis. Chrysanthemum tea with a little fresh ginger added can help with itchy, red, and burning eyes due to allergies. It can also help your head feel less stuffy. Take the tip of your tongue and press against the roof of your mouth while at the same time pressing the spot right between your eyebrows with your finger. Hold this for a few minutes and it will help your nose clear. Press along your eyebrow. Start at the center of your forehead and move outward to the edge. Hold the inner most point, the middle point, and the outer point the longest. Do this several times to clear the upper sinuses. Massage your head. Press with your fingertips all along your scalp moving from the forehead to the back of the head. Massage and press all along at the base of your skull where it meets your neck. Massage and press the area of skin between your thumb and first finger. This will help any congestion to drain out of the nose and face. For a sore throat massage along the radial edge of your thumb from your wrist to the nail. Get an air purifier for your bedroom and let it run at night while you sleep. Allergies can be tough to deal with, but there are natural options to help. Don’t forget to make an appointment with your acupuncturist!